Up until a few days ago I thought Fortnite was throwing blankets over "things" in the living room and building a fort. 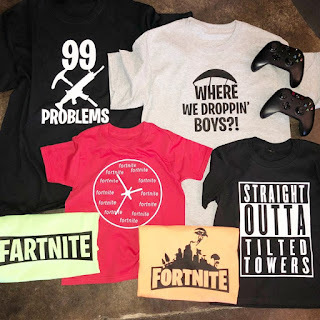 Grab a few of these Fortnite Tees 15 Styles!! Available in youth and adult sizes, five colors ONLY $12.99! $3.99 for the first item and $2.99 for each additional item. US only. Seller usually ships within 5 business days. Ships no later than Sun, Jun 3.